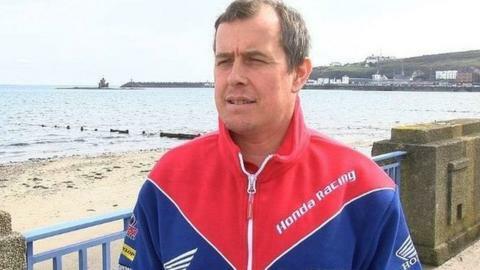 Morecambe rider John McGuinness has said he is still hungry for success as he prepares for another tilt at Isle of Man TT glory next month. The 23-times Isle of Man TT winner will again ride Honda machinery as he moves ever closer to the late Joey Dunlop's all-time record of 26 wins. Speaking at the event's launch in Douglas, he said he would be "disappointed" not to add to his tally. The 43-year-old won both the Senior race and TT Zero class in 2015. On his way to victory in a shortened four-lap race Senior race, he also set a new absolute course record of 132.701mph in the process. John McGuinness equalled Mike Hailwood's record of seven Senior race wins at the Isle of Man TT. His victory took him level with Mike Hailwood's record of seven Senior race triumphs. McGuinness, who turns 44 this week, said: "I feel strong. I'm not the fittest guy in the world but when I get on the bike I feel 21 again". "I spoke to Joey's wife last week and she gave me the family's blessing. Joey was a national treasure and it might upset some if I caught his record, but records are there to be broken. Joey Dunlop died in Tallinn, Estonia, in 2000 while leading a 125cc race - his death coming just weeks after he secured a hat-trick of TT wins - aged 48. McGuinness will be competing in six races at this year's event, which will be his 20th year of competing. He added: "Even with all my experience, I will still have butterflies - you never know what will happen and the quality of the field is getting better every year." "I 100% want to win and I believe I can. I will be disappointed if I don't reach the top step this year."